Sprinkler systems are always at the ready, with a water supply ready to douse a fire at point of activation. We often think of them in terms of fire safety, so it’s easy to forget that part of their function impacts water quality, too. Backflow Prevention Devices are an important part of keeping both fire and water systems functioning properly. 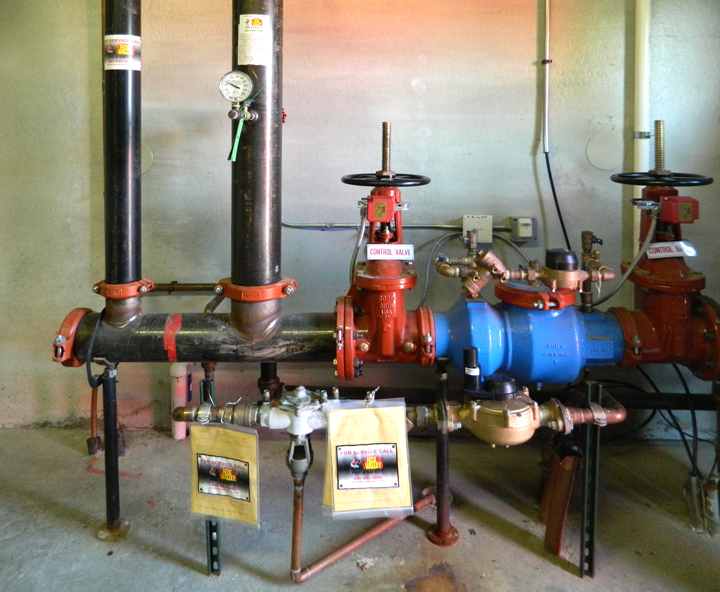 Backflow prevention assemblies stand between your fire sprinkler system and the potable water supply. These plumbing system valves protect drinking water from the potential back pressure or back-siphonage from fire sprinkler systems. Because sprinkler systems don’t ideally experience regular water flow and movement, these systems can sit stagnant for long periods of time. The accumulation of debris or the breakdown of the system can compromise the seal, which means backflow may not be prevented. Backflow valves are also key points for the accumulation of sediment which can damage the effectiveness of a fire sprinkler system. In addition to annual, semi-annual, quarterly, and sometimes even monthly inspection of sprinkler heads, main drains, test valves, and exercise controls and valves, a separate annual backflow test is necessary to keep your system functioning properly. Backflow tests assure that stagnant water in any sprinkler system — or irrigation system, or boilers — remains isolated. Keeping this water routinely flushed and monitored is essential to the health of the domestic water supply. You don’t want contaminated sprinkler system water back flowing (leaking) into your domestic water supply. Backflow devices should be tagged with an Inspection Report, a duplicate of which you should keep for your records. Backflow Testing is just one of the regular inspection and maintenance services offered by the Fox Valley Fire & Safety team. Contact our team today to learn more about inspection, system testing, and keeping your sprinkler system flowing.